Yahoo’s Flickr photo sharing service may be the leading player in its industry, but on the surface it’s scarcely changes in more than 6 years. That’s now changed, with Yahoo rolling out a set of updates to Flickr’s photo pages that subtly refresh the site’s presentation and capabilities…and bring some long-wanted features in hand. “We’ve been keen to build a better showcase for your photos for some time. Your photos—everyday captures and extraordinary sightings, local scenes and exotic moments—are central to our DNA because they reflect your individual stories,” wrote Flickr’s Josh Nguyen on the service’s blog. ” With the new photo experience, you can discover, share, and organize your visual stories in a new and improved way. Flickr’s new photo pages most prominent change is the ability to display location information along with an image, with option photo location information being displayed to the right of the primary image, right alongside the photographer’s name, the image date, and camera information. Flickr has also tucked away many common actions into an “Actions” menu to get them out of the way of a photo’s presentation. Default images are now wider, expanding out to 640 pixel by default to take advantage of the wider screen real estate many Web surfers now have. Flickr has also updated its photo navigation controls with “Newer” and “Older” buttons within photo sets, and the preview filmstrip now enables users to preview the photos surrounding the image currently being viewed in a new photoset. When other Flickr users mark a photo as a favorite, that now gets noted in a photos comments—which could have privacy implications, since it effectively means the entire world knows if you’ve marked a photo as a favorite. Perhaps the most noticeable feature in the significant update is a new lightbox view that enables users to take in images of any size using a dark background. 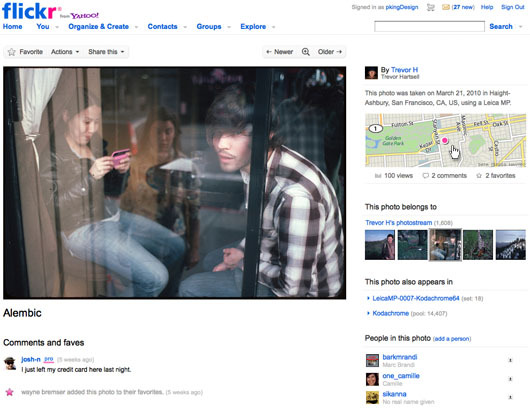 Yahoo expects to be able to roll out the new photo pages to all Flickr users in the coming weeks.